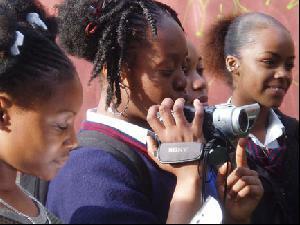 For this project, we worked with 11-15-year-olds from neighbourhoods where we have ongoing video workshops (Rotherhithe and Peckham in south-east London, and Kennington and Stockwell in south-west London) so they could carry on their involvement with video production beyond the time limit of this project. In short, intensive sessions, the participants were given basic video training in camera, sound and interview techniques. Then they immediately started to make video clips about learning and education. The clips were made for Channel Four Online in connection with the TV series ‘The Unteachables’. The idea was to contribute to the debate on education from the point of view of school kids. Despite its tabloid title the series "Unteachables" was a very well received contribution to the debate on education and exclusion.